I mean that in a work sense, because it sucked. For those that don't know, don't remember or don't care, I do tech support for automobile estimating software. Usually phones, but we have live chat support, and I do that most days. Today was a nice convergence of I don't know what. See, we have two programs: one is higher end, cloud based, files route back and forth between the shops and our servers, ultimately ending up with the insurance company. The reason why they can write and estimate, get approved and get your car repaired in a week or less nowadays, as opposed to a few weeks 20+ years ago, is software like mine. The other software that creates estimates is non communicating. It's an older software from a company we bought out before I started working here. Very basic, but what it does it does well, so it has a loyal following for those mom and pop shops that don't give a damn about the big insurance companies. Here's where I told that gecko to cram it. Well, the higher end downloads updates, while the lower end users are shipped disks to update. If you fail to pay you bill, you don't get a disk, and the database will expire after 60 days. Same basic idea with the higher end - the program will be refused pulling down an update and boom - expired database. Today was the 15th, and for some reason all hell broke loose when it came to database expirations. Then you factor in we are going through an upgrade with the independent appraisers, and your basic "this doesn't work" and "how do you do that" questions. It was a busy day. In 8 hours, I took 44 chats and very rarely was I working just one thing at a time. By noon my brain was burnt out. Flipping quickly between multiple issues, regaining the problem and working out a solution taxes your mind. Thankfully, working from home, I didn't have to deal with traffic to get to the solitude of the 2x3 castle. It was one of those days where you just wanted to log off and screw the job. Luckily, I am surrounded by cards while I work and new ones come in all the time. Reds fan, and case breaker for the masses Chris over at Nacho Grande dropped some cards on me a short time back, meeting all the spectrums. Jose was a dupe for the DP binder, but fit nicely in the Sox Box. Tadahito went to the player collection, and Jorge is a fine example of the Sunday wear the ChiSox had about 15 years ago. 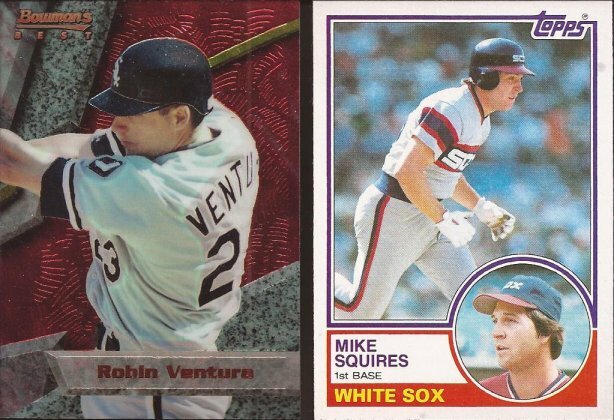 A shiny Robin, and an addition to the Sox team sets. With luck, I can finish a lot of them off at the National in a couple weeks. Biggest stack in the package was a lot of GQ to put me closer to the complete set. Any help is greatly appreciated. Lastly, one of Chris' friend's AWESOME custom minis, and an Abreu to boot. I have decided to try my hand at my own set of minis, based on a project proposed here. Not sure my quality will match this Abreu, or any of the other great customs I see around the blogsphere (did I spell that right, AJ? ), but it's all for fun. Thanks Chris. Thanks to all of you for talking me down. Have a beer my friend....you've earned it. It's almost Friday, bro. Hang in there. It's funny how a package of cards can make you feel better. Hope today was better. I usually take a deep breath and hold it til I pass out. Have a good weekend friend!